Narkanda - Travel to Narkanda in Indian Himalayas which is full of amazing sights, blessed with all the natural bounties, surrounded by towering peaks, trekking and hiking trails, a popular destination known for its immense natural beauty all over the world. A hiss road with superb views links Narkanda with Shimla. 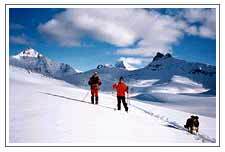 Narkanda, located amidst fragrant pine forests is a ski resort in winter. It has a choice of slopes ranging from a beginners run and slalom slope, to sharper descents for the experienced skier. What gives Narkanda its awe-inspiring view of the snowy peaks is the fact that it is located on the ridge of the last watershed before the Himalayan range. Below Narkanda, to the north is the Sutlej Valley and beyond it is the snowy massif. The ridge on which Narkanda stands is the watershed between the Sutlej on the north and the Giri river. The sleepy town of Narkanda sits astride the watershed between the Arabian Sea and Bay of Bengal. A better view of Narkanda is obtained from the nearby Hattu peak, which is nearly 2,000-feet higher than Narkanda, and just over an hour's trekking distance from it. The ancient temple of Hattu Mata is alive with skiers. The pretty orchard country of Thanedar and Kotgarh- beautiful in spring- are not far away from Narkanda. Khadrala and Baghi with their dense forests and Kumarsain with an interesting wooden palace are also within easy reach of Narkanda. The fact that Narkanda is on the National Highway connecting Shimla to Kinnaur means that there is never a shortage of buses connecting one with Shimla. 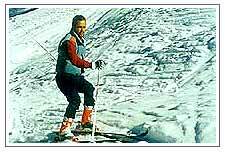 Shimla is at a distance of around 60-km and it takes only two hours to drive down to Narkanda from there. Accommodation options in Narkanda are rather limited. The Himachal Tourism Corporation hotel, a bit away from the settlement, and the P.W.D.Rest House located just below a pine forest on a mountain slope, offer luxury and the warmth of Himachali hospitality.